PGA Tour Veteran Brad Faxon, who has won around $18,000,000 in his career but only has made 10 cuts in his last 44 events going back to 2007, is joining the NBC Sports' golf team. He will be "an outer tower commentator at multiple events in 2010." This is an interesting choice, and it will be interesting to see how it goes. It also means I will need to check and see who he is is replacing (if anybody). Here is the release from NBC Sports, followed by his profile as published by the PGA Tour. 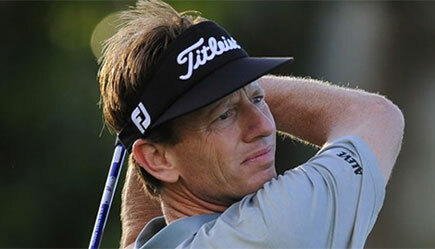 NEW YORK - Jan. 12, 2010 - Brad Faxon, a winner of eight PGA Tour events and a 27-year veteran, will join NBC Sports’ Emmy Award-winning golf coverage as an outer tower commentator at multiple events in 2010. The announcement was made today by Tommy Roy, NBC Sports’ lead golf producer. Faxon, who has won nearly $18 million on tour and is regarded as one of the game’s premier putters, will have the option to play as well as commentate at a number of events this season. (8) 1991 Buick Open. 1992 New England Classic, The International. 1997 Freeport-McDermott Classic. 1999 B.C. Open. 2000 B.C. Open. 2001 Sony Open in Hawaii. 2005 Buick Championship. (1): 1993 Heineken Australian Open [Aus]. [with Scott McCarron]. 2002 Franklin Templeton Shootout [with Scott McCarron]. 1-- Buick Open, New England Classic, The International, Freeport-McDermott Classic, B.C. Open, B.C. Open, Sony Open in Hawaii, Buick Championship. season-best total and a T57 finish at Wyndham Championship...Will play the 2010 season on a Top 50 PGA TOUR Career Money List exemption. for the first time since 1983 and used a one-time, top-25 all-time money list exemption for 2008...Best finish was a T33 effort at the Travelers Championship...Underwent season-ending foot surgery on August 23. 2006: Made only 13 cuts in 26 events entered...Was three strokes back through 36 holes at THE PLAYERS Championship, but weekend rounds of 79-69 dropped him to T16. 2005: Won for the first time in nearly five years. Earned eighth career TOUR title in 598th career event at the Buick Championship, defeating Tjaart van der Walt in sudden-death playoff. Started the final round seven shots off the lead, and posted a career-best 9-under-par 61 to overcome third-round leader Justin Rose and van der Walt. On the first playoff hole, stuck a 7-iron from a fairway bunker to 3 feet. Converted birdie and clinched victory after van der Walt missed 10-foot birdie putt try. Became first player since Jose Maria Olazabal (2002 Buick Invitational) to win after making the cut on the number. Earned a career-best paycheck of $774,000 to push season earnings over $1 million for the fifth straight campaign...Three weeks after winning, had surgery on September 13 to repair a torn anterior cruciate ligament (ACL) in his right knee and missed the remainder of the season. He injured his knee in late 2003 and played in pain for almost two years...Recipient of the Payne Stewart Award, given at THE TOUR Championship. 2004: Slow start to the season due to an injury in the off-season. Missed the first month of the season rehabilitating a torn right anterior cruciate ligament without surgery. Made his first start at the AT&T Pebble Beach National Pro Am on February 5, where he missed the cut...Had a stretch of 362 consecutive holes without a three-putt, the longest on TOUR in five years. Streak lasted 19 rounds, from PGA in August to Chrysler Classic of Greensboro in mid-October. 2003: Notched eight top-10s spread over seven months with career-best earnings of $2,718,445...Finished third at the Buick Invitational, T2 at the Bay Hill Invitational, second at the Chrysler Classic of Greensboro and lost in playoff to Bob Tway at the Bell Canadian Open. 2002: Despite not winning on TOUR for the first time since 1998, finished season 31st on TOUR money list with $1,814,672...Finished T2 at Nissan Open, one stroke behind winner Len Mattiace...Lost to eventual winner Kevin Sutherland in the semifinals of the Accenture Match Play Championship. Finished third after defeating Paul Azinger on the 19th hole in the consolation match...Also T2 at The Honda Classic. 2001: Returned to the top 30 on money list (18th) for first time since 1997. Earned a victory for third consecutive year. Won Sony Open in Hawaii by four strokes. Made an eagle during each round. Had five-shot cushion after 36 holes and was three up going into the final round. 2000: Became the first player in B.C. Open history to successfully defend his title with a one-stroke victory over Esteban Toledo. Spent July 16-17 in Scotland, attempting to qualify for British Open. After failing, he caught a flight home to play in B.C. Open. Started with a 68-66 and was T2 through 36 holes, trailing Toledo by three strokes. Third-round 68 lifted him into tie for 54-hole lead. Closed with a 68 for his seventh TOUR title. Won B.C. Open twice while age 38--in 1999 tournament held in the fall and in 2000 event played in summer...Earned his third putting title. Led the TOUR in Putting Average in 1996 and 1999 and in 2000 had a 1.704 average (a new record at the time). 1999: Won B.C. Open in playoff over Fred Funk. Trailed Funk by five strokes through 36 holes, closed with 70-67 to force playoff. Due to Hurricane Floyd, final 36 holes played Sunday. Due to darkness, playoff held Monday morning when he won with par on second extra hole. 1997: Earned first victory since 1992 at Freeport-McDermott Classic. Gained one-stroke lead with third-round 66 and secured a three-stroke victory over Bill Glasson and Jesper Parnevik with final-round 69. Posted runner-up finishes at Greater Greensboro Chrysler Classic, MCI Classic and MasterCard Colonial and for second straight year finished among top-10 on TOUR money list. 1996: Surpassed $1 million in earnings for first time on strength of four runner-up finishes. Made all 22 cuts...Lost playoff to Jim Furyk at United Airlines Hawaiian Open, finished three behind Steve Stricker at Kemper Open, lost playoff at Sprint International to Clarence Rose and closed with 68 for second at THE TOUR Championship. 1995: Featured five top-10s and first selection to Ryder Cup Team...Shot front-nine 28 in final round of PGA, the second 28 in major championship history (Denis Durnian, 1983 British Open). 1992: Earned two TOUR victories. Defeated Phil Mickelson by two strokes at New England Classic...14-point final round good for two-point victory over Lee Janzen at The INTERNATIONAL...Also lost two playoffs, to Steve Elkington at Infiniti Tournament of Champions and to Dan Forsman at Buick Open. 1991: Defeated Chip Beck in playoff for first official TOUR win at Buick Open. 1986: Earned unofficial victory at Provident Classic when he defeated Scott Hoch by one. Amateur: Winner 1983 Fred Haskins, Golf magazine and NCAA Coaches Awards as nation's outstanding golfer...1982-83 All-America selection at Furman...Winner of 1980-81 New England Amateurs and 1979-80 Rhode Island Amateurs. professionals for their unselfish contributions to society...Along with Andrade, serves as host for CVS Charity Classic, which is Rhode Island's largest charitable sporting event (cvsgolf.com)...Created own junior golf foundation and hosts its annual tournament in Rhode Island. Co-Chair, with Andrade, of Button Hole, a short course that serves as a teaching and learning center for kids. Walker Cup (1), 1983; Ryder Cup (2), 1995, 1997; Dunhill Cup (1), 1997.